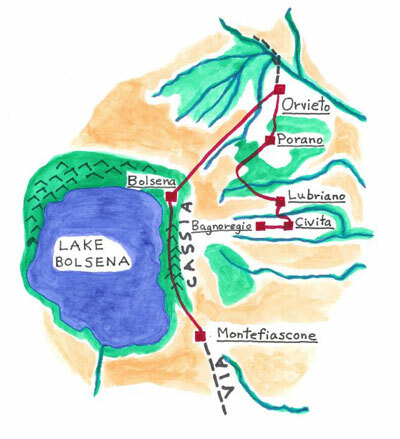 Terrain: volcanic Lake Bolsena – pristine wooded shores, two scenic islands. Orvieto’s massive butte surrounded by rolling farmland and vineyards. 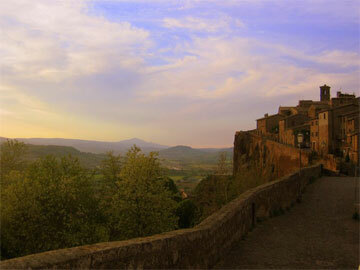 Near Bagnoregio, a vast expanse of calanchi – soft, crumbly rock eroded into extraordinary formations. Of interest: Montefiascone’s hilltop fortress and stunning lake views. Bolsena’s medieval quarter, castle and ancient ruins. Orvieto’s etruscan necropolis, well of San Patrizio, and cathedral – a masterwork of Italian Gothic art. Remarkably picturesque Civita di Bagnoregio on its eroding bluff. The Etruscan city of Velzna (today’s Orvieto) was destroyed by the Romans in 265 BC; its inhabitants may have been moved to Lake Bolsena, where the Romans founded a town. The Roman Via Cassia was to pass here: for two millennia this route has served pilgrims, merchants, noblemen, diplomats, and artists – its ruins inspired Michelangelo and his contemporaries as they journeyed between Rome and Tuscany. Orvieto’s magnificent cathedral was built in the fourteenth century to commemmorate the miracle of Corpus Christi, which had occurred at Bolsena. From Montefiascone the Via Cassia – still with some ancient paving in place – mounts a ridge with spectacular views of Lake Bolsena. After a picnic lunch by a clear woodland stream we arrive at Bolsena town, where a cluster of stone buildings (including the church and catacombs of Santa Cristina) wraps the hillside, and the ruins of a Roman settlement overlook the lake. Rising eastward out of the crater we enter Umbria, crossing rolling farmland with giant oaks and chestnuts and a sprinkling of Etruscan tombs. Soon a breathtaking sight looms ahead: Orvieto on its rocky promontory, with sunlight reflecting off the gilt face of the massive cathedral. From Orvieto an old track leads through hills and woods to Lubriano, where we’re rewarded with vistas of Civita di Bagnoregio on its crumbling bluff, and the eerily eroded calanchi landscape to the east.